Abstract: This paper explores neuromorphic approach capabilities applied to real-time speech processing. 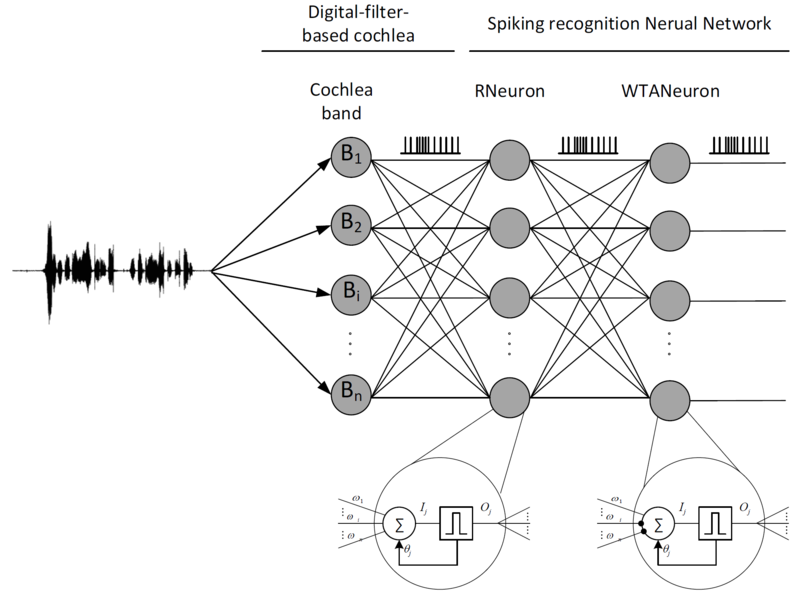 A spiking recognition neural network composed of three types of neurons is proposed. These neurons are based on an integrative and fire model and are capable of recognizing auditory frequency patterns, such as vowel phonemes; words are recognized as sequences of vowel phonemes. For demonstrating real-time operation, a complete spiking recognition neural network has been described in VHDL for detecting certain Spanish words, and it has been tested in a FPGA platform. This is a stand-alone and fully hardware system that allows to embed it in a mobile system. To stimulate the network, a spiking digital-filter-based cochlea has been implemented in VHDL. In the implementation, an Address Event Representation (AER) is used for transmitting information between neurons. Fig. 1. Spiking recognition neural network overview.